Here at the National Coarse Fish Rearing Unit near Nottingham, the new spawning season is in full swing where each year we spawn and rear 9 different species of fish. The process starts in March with dace and grayling. This is followed by chub, barbel, roach, bream, rudd and crucian carp in May and finally with tench in June. The fish we rear are used to stock rivers and lakes all over England. The spring of 2015 proved to be a challenge for predicting when the fish will spawn. Over the past 30 years we have managed to collect ripe fish (male and female fish that are ready for spawning) from the rivers in one trip to spawn them. This year it’s been more difficult due to the unseasonably cool April and May. We have had to keep a close eye on river temperatures and make more than one trip to pick up different fish species. The low temperatures have delayed spawning in some rivers by up to 3 weeks. So far this year we’ve spawned more than 3.5 million fry (baby fish) and currently, we have more than 2.5 million in troughs in the hatchery waiting to be transferred into our ponds. Most of these fry will be stocked back into the rivers where the adult fish came from. All of these young fish are being fed a mixture of natural and artificial food. 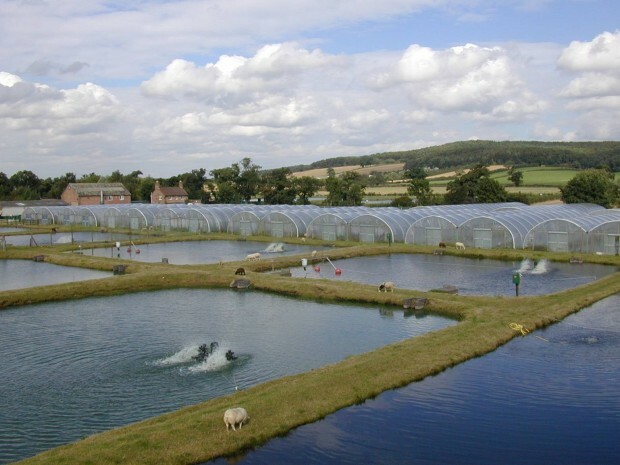 The natural food is obtained from our specially prepared ponds and we supplement this with Brine Shrimp (or Artemia). This tiny shrimp, which is less than a quarter of a millimetre long, look like tiny grains of sand and when hatched, the young fish love to feed on them. Over the last 3 months we’ve been working hard to get the ponds ready for the young fish. 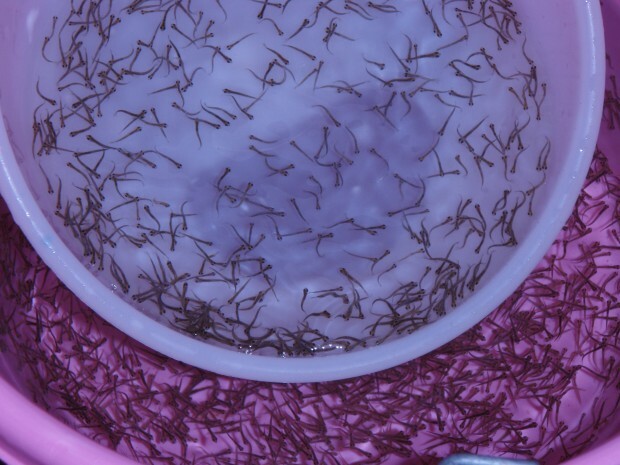 By filling them with pure groundwater and adding natural manure we can encourage the growth of the tiny animals that are the first-feed of all our baby fish. 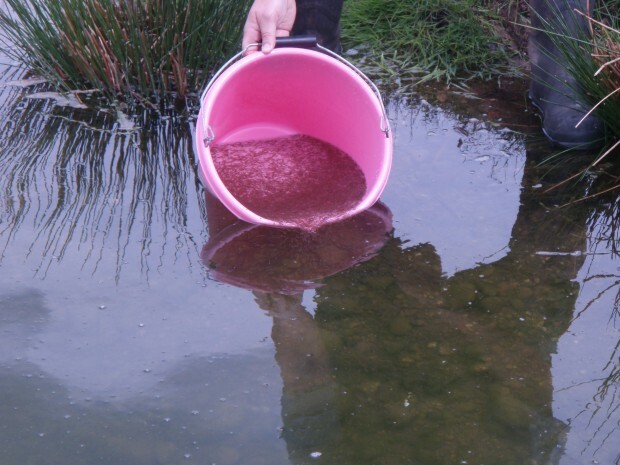 When we move the small fry into the ponds they’ll be swimming in a “food soup” and they will grow very quickly. The young fry will spend the next 8 or 9 months in these ponds by which time they will have grown from 5 or 6mm to 5 to 8cm. They will be kept on site for another summer before they are stocked out in October or November. These 18 month old fish will range in size from 10 to 20 cm long when they are stocked in to the wild. A few months later, by the following spring, we’re ready to start the process all over again with a new group of fry. There is a facebook group called The River Tame Hunters, based in Tameside, near Manchester. We would like you to fully consider stocking the River Tame in the Hyde area, Roach, Dace and Chub, Gudgeon. The River in that area has a variety of fish habitats ranging from fast gravel runs to slower, deeper stretches and would be ideal for a stocking programme. The Tame itself has been stocked a few years ago further downstream (Reddish area) but there are at least 2 sizable weirs that make it impossible for any fish to migrate upstream to the Hyde area and beyond. I would ask you to fully consider an urgent stocking for this section of River. It is worth noting that a sister River of the Tame, the Goyt has had your previous support in stocking it and myself and many other local Anglers feel that it is about time that the Hyde/Dukinfield area of the Tame was now given the same consideration. Please contact me to let me know how this may progress. Many thanks Graham D. Hurst. Re stocking of the River Tames is routinely carried out and has been re stocked in the last 5 years we will continue to take action when necessary and when policy allows us to do so. The river tame in tameside greater Manchester is in dire need of stocking. It has done quite a good job of supporting it's resident population of brown trout with minnows. But there is a gross shortage of silver fish. There are a handful. But the resident Gooseanders have taken their toll and this has lead to sport on there being very slow and patchy. Yet there are some beautiful stretches on there capable of holding much more than they do. But the resident anglers are fighting a losing battle against the Gooseanders and the immigrants. Please consider introducing some fish into the river to try and re establish some breeding stock. Are there any plans to stock the River Tame in Hyde Tameside with Barbel? The habitat is perfect for them. They have bred successfully lower down the river in Stockport but cannot navigate Harrison's weir in Reddish Vale Park to migrate up Stream without a fish ladder. At present there are no plans for introducing Barbel or any fish species in the River Tame. Stocking fish can be important in fisheries management, but they should never be used in isolation. We undertake fish introductions as a part of our work to maintain, improve and develop fisheries. It is important that all of our fish movements are carefully planned to ensure that they are a success and provide the best possible value. Poorly planned stockings can have negative ecological and genetic impacts. Hi Margaret can you please tell me where and what fish stock? We know it was stocked at reddish vale but due to a few big weirs we don't get any other fish apart from brown trout up this end the part of the tame in tameside Hyde dukinfield and staylebridge thanks Alan timms. Hi could you tell me if there are any plans to stock the Bristol and Hampshire Avon with Barbel. Unfortunately a combination of Otters, Mink and Cormorants have decimated stocks. I have spent many hours observing the decline of this species. Since 2012, we have annually stocked the Bristol Avon and some of its tributaries with juvenile barbel to help boost numbers, following reported declines in the population from anglers and low catches in fish surveys. Last month we actually stocked 4,000 juvenile barbel in the main Bristol Avon south of Malmesbury and on the River Marden. The Barbel Society have been involved with small scale habitat restoration projects in the catchment with the local rivers trust, and we are keen to develop further projects in the area to help improve fish passage and habitat. We would be interested to know if there is a particular stretch of the Bristol Avon catchment that you are concerned about. We have done a lot of partnership working with the local rivers trust, Barbel Society and local clubs on the Hampshire Avon - this includes habitat improvements, looking at the diet of cormorants etc - data is due to be published soon. Barbel continue to be caught in good numbers on the Hants Avon and are not at a level where re-stocking has been considered - is there a particular location that causes you concern? We can then investigate. Just read this article, i'm not a scientist but the diet of cormorants is fish (save you looking in to it).